Tameside Metropolitan Borough Council has a wonderful wealth in relation to its portfolio of public buildings that have generously been described as being iconic venues. These prestigious and stylish settings located across the borough accommodate a variety of events differing in size and style. The venues have amazing spaces offering the ideal settings for corporate entertaining, training, conferences, wedding receptions, multi cultural events and other family celebrations. The dedicated Event team will guide you though all aspects of your event offering advice on conference management, catering and private events to other services such as lighting, music and floral displays ensuring that we provide you with an unforgettable event every time! For your special event we pride ourselves with the knowledge that we manage classically romantic settings for which to celebrate the special day with your loved ones. The magnificent settings combine unbelievably contemporary and Victorian architecture with stunning entrances and grand staircases. The perfect locations for large receptions! 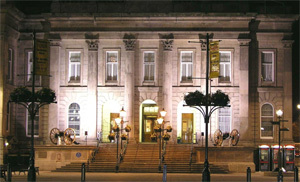 Within the Town Halls we offer some of the finest meeting rooms in the North West. Whatever the occasion – formal board meeting, executive training sessions or high level briefings - sophisticated audio visual equipment will enhance your presentations ensuring that your conference requirements are met by our business facilities team. The conference and meeting rooms offer 21st Century technology in environments in which guests feel very much at home - unsurpassed standards of comfort and service. Our commitment is to focuses every part of our service to meeting your needs, your way! The council can provide an interpreter in the main Asian languages spoken in the borough (Bengali, Gujarati, Punjabi and Urdu. Contact Customer Services or telephone 0161 342 2810. The council also provides a service for deaf people available in British Sign Language, sign supported English, Deaf-Blind Manual,Hands on and lip speaking, on 0161 342 2575 (voice).